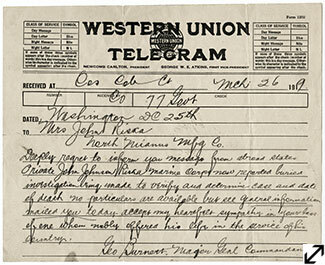 Telegram, March 26, 1919. Informing Mrs. John Riska of death of John Johnson Riska. Greenwich Historical Society, William E. Finch, Jr. Archives. Gift of Mrs. William Riska. John Riska, age 16. Photograph, c. 1917. Greenwich Historical Society, William E. Finch, Jr. Archives. Gift of Mrs. William Riska. Young men who enlisted in the military could express their loyalty to the United States while also contributing to their family's income. This was true for John Riska, a member of the working class whose family had emigrated from central Europe. American military leaders were anxious to sign up newcomers. They used recruiters who spoke foreign languages and trumpeted the successes of New York's "Rainbow Division," consisting of men representing varying ethnic origins, as a "Melting Pot" ideal. 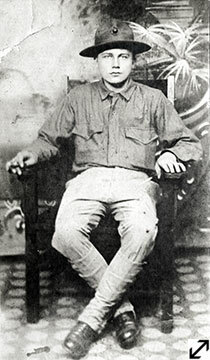 Although Riska listed his home address as Newark, New Jersey, when he joined the Marines, his parents lived with their large family in Greenwich. He wrote to them care of the North Mianus Manufacturing Company in Cos Cob. 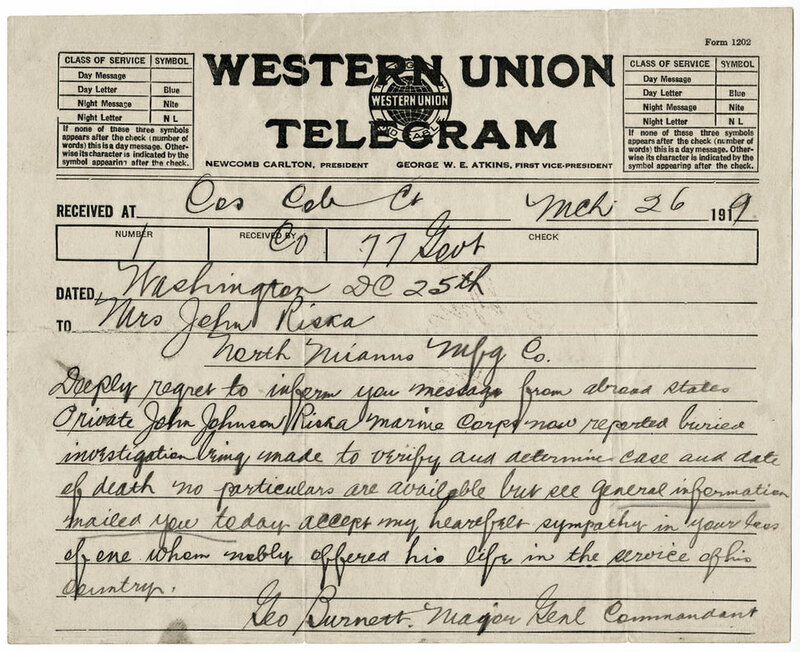 His letters, filled with confidence and good cheer, also reveal a young man anxious for reminders of home. His requests included news of loved ones, especially about his baby brother Andy, and even specific movie magazines. Tragically, John Riska never returned home. He died on June 12, 1918, and was buried in the Aisne-Marne Cemetery in France.